The full course is 45 minutes long and available in a number of affordable formats. 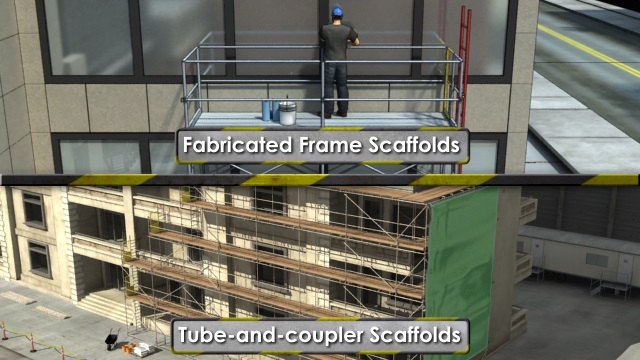 Fabricated frame scaffolds are modular and come pre-formed and connected. 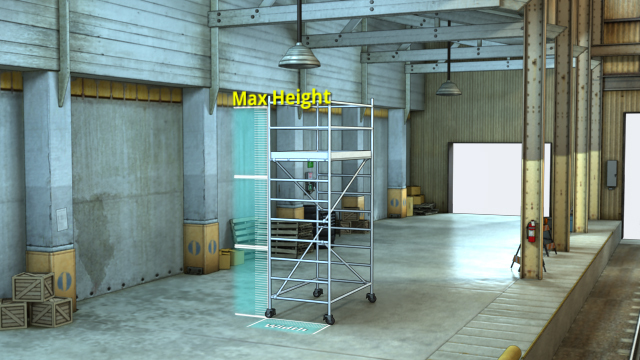 The maximum allowable height of a free-standing scaffold depends on the width of its base. 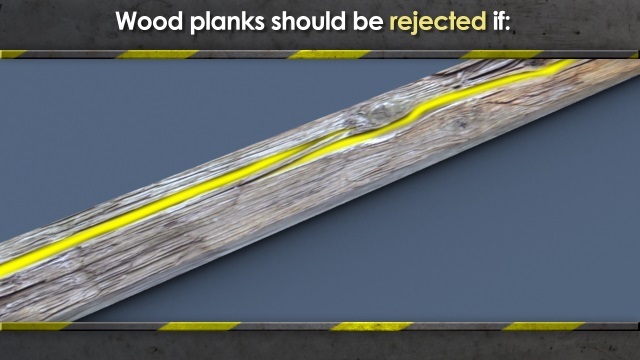 Wood planks should be rejected if they have any damage to them (knots, splitting, wood rot, etc.). This course is intended for Canadian-based companies and individuals and meets Canadian regulations. 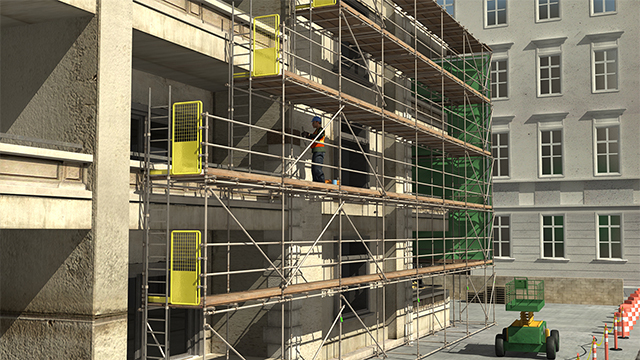 This course covers some of the more important regulation requirements for supported scaffolds, as well as basic safe practices for working on or near these scaffolds. It is intended as an introductory or refresher course for construction and general industry workers who will be working on or near scaffold systems. What are you required to do if working on surfaces over 3 meters tall? 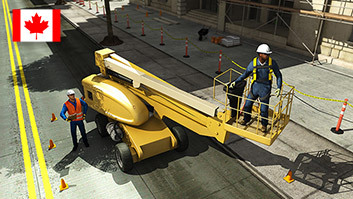 Regulation requires fall protection for scaffold workers who are working on surfaces that are elevated 3 meters or more. What are the three most common frame and tube-and-coupler supported scaffold types? The main types of supported scaffolds are: fabricated frame scaffolds, tube-and-coupler scaffolds, and mobile scaffolds. 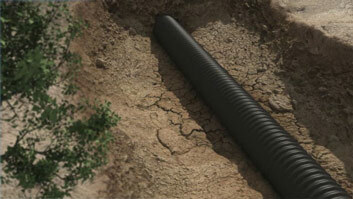 What are the main components to scaffold footing? Base plates and mud sills are the main components and are used to stabilize the scaffold foundation by spreading weight over a greater surface area. What are the height restrictions for a free-standing scaffold? The maximum allowable height of a free-standing scaffold is dependent on the width of the base; it cannot exceed three times its base width. What additional supports must you use if the height of a scaffold cannot be freestanding? When a scaffold can no longer be free standing due to its height, Guy wires (wires connected from the scaffold to the ground), as well as Ties and Braces (these connect a scaffold to an adjacent structure, like a building). What factors must be taken into account when determining load capacity for a scaffold? The scaffold's height, material being used, and the amount of cross-bracing must all be factored in. What are the commonly used scaffold tags used to communicate the status of a scaffold to onsite workers? 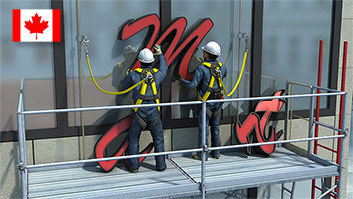 The tag system that is commonly used includes: a red tag, which indicates the scaffold shouldn't be used; a yellow tag, which indicates the scaffold has been modified to meet specific requirements and may be hazardous; and a green tag, which indicates the scaffold is safe and ready to use. What is the fall protection system regulation that requires if a person is working in an area where they could fall more than 3 meters? 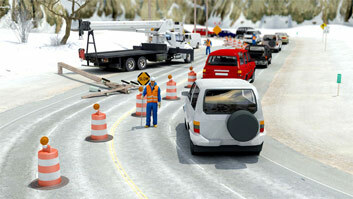 The two types of fall protection required by regulation are Guardrails and Personal Fall Arrest Systems (PFAs). How often should the competent person inspect the scaffold and its components? It should be inspected at the following times: daily-before each work shift and after any event that may have created a new hazard. Scaffolding can be overloaded by placing too much weight on the structure. Overloading is a common cause of scaffold collapse. In general, a scaffold must be able to support its own weight, plus four times the maximum intended load. The intended load includes people, materials, tools, and any additional components the scaffold will support. 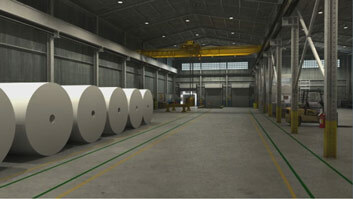 Most scaffolding components have a designated load capacity given by the manufacturer. For the most part, components from different scaffold systems should never be mixed and matched. This is especially true of components that are made of different metals, because there can be a chemical reaction between the metals that weakens them. The competent person can decide if components from different systems can be used safely together.